Breaching humpback. Photo by Alison Ogilve. Humpbacks are one of the most easily identifiable cetaceans. Some key characteristics to look for are the long, knobbly-edged flippers, the low, broad, and stubby dorsal fin behind a back hump, and the knobs lining the top of the head, lower jaw. The head may also host some barnacles. There are some smaller bumps ("knuckles") between the dorsal fin and tail. The throat has 12-36 pleats, used for throat expansion during feeding. The tail, seen in the bottom left photos, has a distinct shape: flukes are broad and separated by a distinct notch, and are knobbly along the trailing edge. The underside of the flukes is mottled with white or grey patches. This pattern of pigmentation is unique to each whale, which has allowed researchers to identify thousands of individual humpbacks around the world. Colouring on the back and sides of the body ranges from bluish-black or dark grey. The underside is usually all or partially white. Pacific humpbacks fins are usually dark on top and white with black markings underneath, while Atlantic humpback fins are generally white with black markings on both sides. Humpbacks are the fifth largest whale in the world. Adults can be nearly 50 m long (164') and weigh 25-30 tonnes. Newborns are around 5 m (16.5') long. They are usually seen individually or in large groups of up to 15 whales. Blow: Like with many whales, a humpback's blow is distinctive and can be used for identification. It is 2.5-3 m high, and fairly wide and bushy. It makes 5-10 blows, then dives. Dive: The dive sequence usually makes the hump in the back more obvious. The dorsal fin is visible during this sequence, which assists in identification. After the dorsal fin disappears the bump of the tail stock is visible, then the tail flukes clearly appear and are usually raised high out out of the water. This sequence signifies a deep dive - the whale will stay submerged for 10-20 minutes. 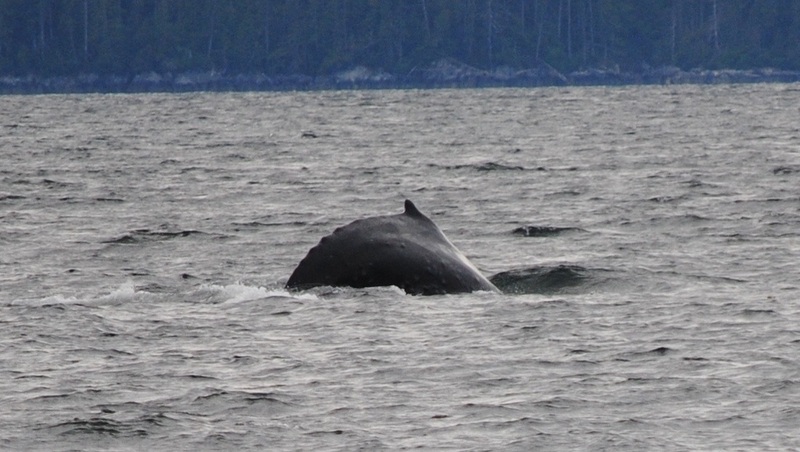 Check out the humpback page on the BC Cetacean Sightings Network for a list of identifying characteristics with photos. Top: the hump in front of the dorsal fin is very evident in this picture by Maria Shallard. Bottom: the distinctive bumpy trailing tail edges and notch between the flukes are visible when the tail is lifted in a dive. Photo by Alison Ogilve. The two photos above show parts of the diving sequence: during a dive the distinctive hump, dorsal fin, and bumps after the dorsal fin are visible, then the flukes appear and usually are lifted right out of the water. Photos by Georgia Brander. Humpbacks are found in all oceans, including tropical and arctic waters. Humpbacks in the northern and southern hemispheres are found closer to their respective poles in the summer, and then migrate to warmer areas closer to the equator in the winter. In summer the northern humpbacks can be found feeding in the cold waters off the coasts of BC and Alaska, and in the Bering and Chukchi seas. In winter they migrate to warmer waters to breed: they can be found around Hawaii, Mexico, and sometimes Japan. Some humpbacks spend their summer in coastal BC waters, while others may be passing through during migration further north in the spring, or south to warmer waters in the fall. While there are at least 10 geographically distinct populations, mixing between these groups does occur. When you spot a dark-coloured whale off in the distance, it can be hard to be sure of what you're seeing. A correct identification is not difficult if you pay attention to key points, such as the size and shape of the dorsal fin, behaviour, and whether the flukes appear during a dive. Minke whales also have a small dorsal fin, but it is more curved, not as stubby, and missing the hump in front. Their flukes do not lift out of the water during diving or surfacing. As well, they do not have bumps on their head or tail stock, and they have much smaller pectoral flippers. Grey whales (Eschrichtius robustus) are mottled with grey and white patches, and they have a little hump for a dorsal fin followed by a line of "knuckles" leading to the tail flukes. Humpbacks can display some impressive behaviours, including breaching (seen in top photo), spyhopping, and tail- and flipper-slapping. While it is tempting to get as close as you can to see these displays, care and caution must be taken while whale watching. Canada's whale watching guidelines can be read on this website. Of particular importance is the mandatory guideline that boats stay a minimum of 100 m from the animal with motors off, or in neutral or idle. This was once a voluntary guideline that few followed, and is now mandatory. Humpbacks were once hunted for their oil and baleen in the Pacific Northwest. More than 5,700 humpbacks were harvested in coastal BC waters. The population of humpbacks in the northern hemisphere was once around 15, 000, and humpbacks were not uncommon in areas like the Strait of Georgia. Now there are between 6000 and 8000. Humpbacks are now legally protected from whaling, but illegal whaling still occurs. Watch the bottom left video, The future for humpback whales, for more information. Male humpbacks sing long, complex, and beautifully haunting songs in breeding season. Recordings of songs can be heard at CetaceaLab, and in the below videos. One feeding technique humpbacks use is called bubble-netting, where they trap prey in a wall of bubbles. This can be seen in the Whale hunting in antarctica video below. Killer whales (transient population) sometimes prey on young humpbacks. A humpback's long pectoral flippers are not just an identifying characteristic from other whales - at up to 5 m long, they are the longest appendage of any animal on Earth. Their annual migration from polar to tropical waters and back is thousands of kilometres long, and takes them on a longer migration route than any other animal. Migration routes in the north Pacific can be seen in the below left photo from SPLASH Research. 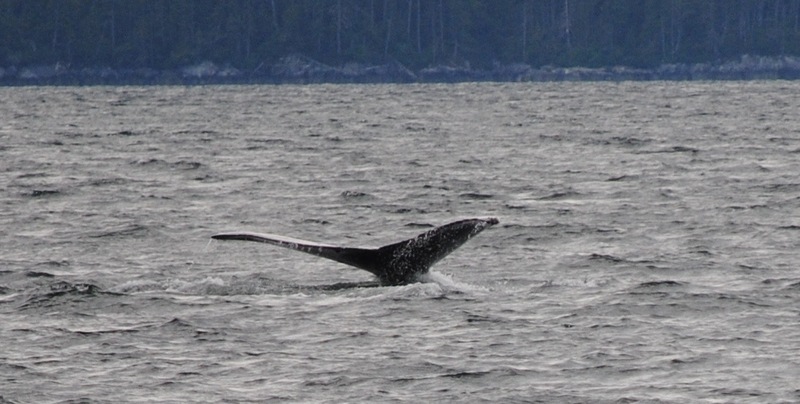 Conservation: North Pacific humpbacks are blue-listed in BC. They are designated as a species of special concern by COSEWIC, and are protected under Canada's Species At Risk Act. While numbers have increased since they were protected from whaling, they are still vulnerable to a number of threats. Most threats come from boats, and include noise disturbance, ship strikes, entanglement in fishing gear, and contaminants. 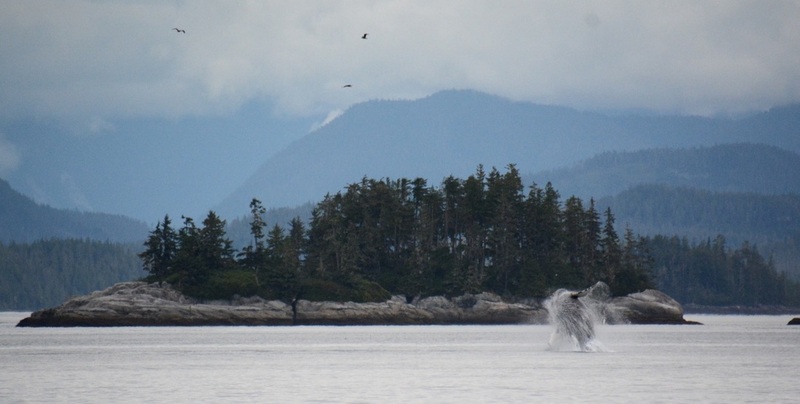 The overlap of humpback habitat and fishing grounds on the BC coast can be seen on the Wild Whales species page. See the SARA Species Profile for more information, and for links to the SARA Recovery Strategy and COSEWIC assessment. Carwardine, M. and Camm, M. (1998). Whales, Dolphins, and Porpoises: the visual guide to all the world's cetaceans. Toronto, ON: Dorling Kindersley. Pp. 76-79. Harbo, R. M. (1999). Whelks to whales: Coastal marine life of the Pacific Northwest. Madeira Park, BC: Harbour Publishing. Pp. 191. Humpback whale (Megaptera novaeangliae). ARKive.org. Accessed 18/07/2013. Humpback Whale (Megaptera novaeangliae). Wild Whales B.C. Cetacean Sightings Network. Vancouver Aquarium. Accessed 18/07/2013. Shore, V. Megaptera novaeangliae (Borowski, 1781). In Klinkenberg, Brian. (Ed.). E-Fauna BC: Electronic Atlas of the Fauna of British Columbia. Lab for Advanced Spatial Analysis, Department of Geography, University of British Columbia, Vancouver. Accessed 18/07/2013.